In today’s world, all the major government organizations and financial firms pressure upon the issue cyber security. Sensitive data of the organizations and those keep largely public data, has been the target of some of the most notorious hackers of the world. Manipulation of, data, theft of data, leaking of company secrets, and shutting down services, are some of the many things that hackers have the license to do once they gain access to a system. 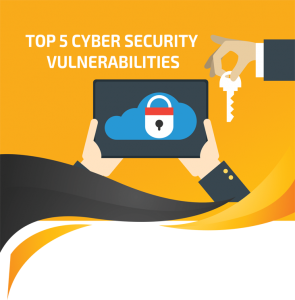 So, let’s dive deep in and take a look at the 5 most dangerous cyber security vulnerabilities that are exploited by hackers. Injection vulnerabilities will occur when an application sends untrusted data to an interpreter. Injection flaws are very common and affect a wide range of solutions. The most popular injection vulnerabilities affect SQL, LDAP, XPath, XML parsers, and program arguments. The injection flaws are quite easy to discover by analyzing the code, but it’s hard to find during the testing sessions when systems are already deployed in production environments. Possible consequences of a cyber-attack that exploits an Injection flaw are data loss and consequent exposure of sensitive data, lack of accountability, or denial of access. An attacker could run an Injection attack to completely compromise the target system and gain control on it. The business impact of an injection attack could be vivid, especially when the hacker compromise legacy systems and access internal data. The vulnerability has been in existence for several decades and it is related to the way bash handles specially formatted environment variables, namely exported shell functions. To run an arbitrary code on affected systems, it is necessary to assign a function to a variable, trailing code in the function definition will be executed. The critical Bash Bug vulnerability affects versions of GNU Bash which ranges from 1.14 to 4.3, a threat actor could exploit it to execute shell commands remotely on a targeted machine using specifically crafted variables. A buffer overflow vulnerability condition comes to existence when an application attempts to put more data in a buffer than it can handle. Writing outside the space assigned to buffer allows an attacker to overwrite the content of adjacent memory blocks causing data corruption or crashes the program. Buffer overflow attacks are quite routine and very hard to discover, while compared to the injection attacks they are harder to exploit. The hackers need to know the memory management of the targeted application to alter their content to run the attack. In an attack scenario, the attacker sends the data to a application that stores in an undersized stack buffer, causing the overwriting of information on the call stack, including the function’s return pointer. In this manner, the attacker will able to run their own malicious code once a legitimate function is completed and the control is transferred to the exploited code which contains in the attacker’s data. There are many types of buffer overflow, but the most popular are the Heap buffer overflow and the Format string attack. Buffer overflow attacks are dangerous, they can target desktop applications, web servers, and web applications. The most dangerous and the most common vulnerability is sensitive data exposure, it results in calamitous losses for an organization. Sensitive data exposure occurs every time a threat actor gains access to the user sensitive data. Data can be stored in the system or transmitted between two entities, in every case a sensitive data exposure flaw occurs when sensitive data lack of sufficient protection. Attackers, therefore, use this vulnerability to inflict as much damage as possible. The targeted data can be stolen when it is resting in the system, in an exchange transit or in a backup store. Malware is used by hackers when the data is in the system and cryptography techniques when it is in exchange transit. The exploitation of a broken Authentication and Session Management flaw occurs when an attacker uses leaks or flaws in the authentication or session management procedures to imitate other users. This kind of attack is very common; many hacker’s groups has exploited these flaws to access victim’s accounts for cyber surveillance or to steal the information that could advantage their crime activities. Applications and products running in production in debug mode or that still include debugging modules. Running inessential services on the system. The exploitation of one of the above scenarios could allow an attacker to compromise a system. Security misconfiguration can occur at every level of an application stack. An attacker can discover the target which is being used in an outdated software or flawed database management systems. This kind of vulnerabilities could have a severe impact for the new paradigm of the Internet of Things. Cyber security is something which is quite an important issue. In this article, we tried to make you aware of some of the most common and dangerous vulnerabilities. Knowing at the initial step is better than knowing it lately, and with this article, we aim to help you in your initial step. cyber security cyber security vulnerabilities by admin.